Church Invite Cards is rated 4.8 out of 5 by 6. 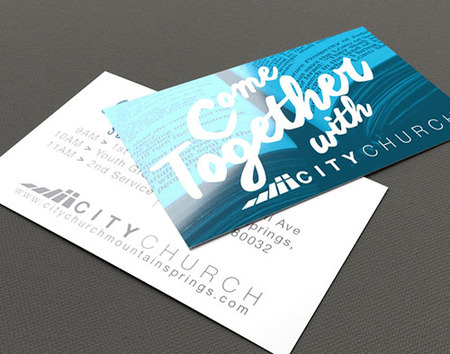 Church invite cards are basically business cards that are used as invitations or small “billboards” to invite and inform potential attendees about your church. Rated 5 out of 5 by LizG from great quality print! Easy to use and upload. Got great customer service when i had some questions and the quality of the product is great! Rated 5 out of 5 by Jwilson0601 from Great quality I, unfortunately didn’t order these early enough for the event at which I was intending to hand them out. They look great, so we’re hoping our members will take some home and pass them out to friends and neighbors. Our options let you get creative with your cards too. You can design yours to be printed horizontal, or make it vertical for a unique style. You can even use a die cut to have yours cut to a shape other than rectangle. Call us for more details and a list of our die cuts available. Same Day Turnaround: for orders sent to press by noon CT, your order can ship the same day by selecting same day turnaround. To make designing and printing your church invite cards online easier, PrintPlace.com offers layout templates. These guides provide you with the right specifications to ensure your design is printed correctly. Download one of the formats below to start. The size of invite cards makes them ideal for many other uses as well. Some churches print small prayers or scripture passages on them, and hand them out to parishioners. The cards can be kept in a pocket, purse, tucked into a bible, or pinned on a bulletin board. They make it possible to have a prayer, literally in the palm of your hand, whenever it is needed. Need more room? Check out our folded business cards page to create folded invite cards.